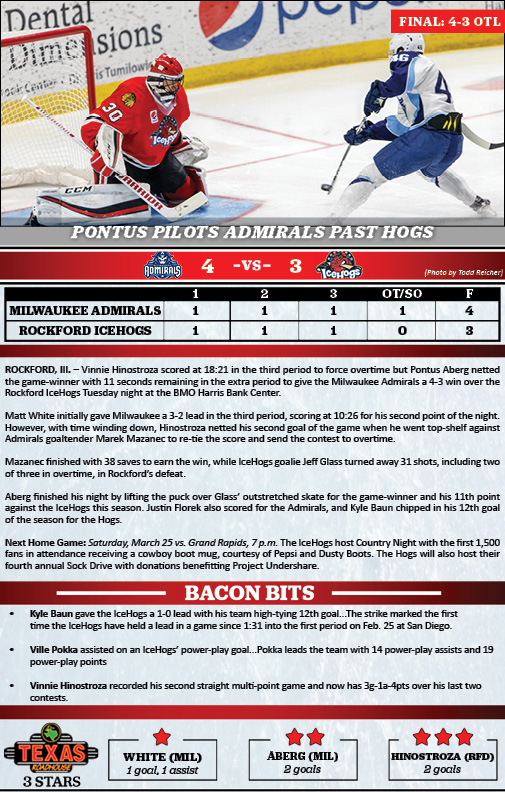 ROCKFORD, Ill. – Vinnie Hinostroza scored at 18:21 in the third period to force overtime but Pontus Aberg netted the game-winner with 11 seconds remaining in the extra period to give the Milwaukee Admirals a 4-3 win over the Rockford IceHogs Tuesday night at the BMO Harris Bank Center. Matt White initially gave Milwaukee a 3-2 lead in the third period, scoring at 10:26 for his second point of the night. However, with time winding down, Hinostroza netted his second goal of the game when he went top-shelf against Admirals goaltender Marek Mazanec to re-tie the score and send the contest to overtime. Mazanec finished with 38 saves to earn the win, while IceHogs goalie Jeff Glass turned away 31 shots, including two of three in overtime, in Rockford’s defeat. Aberg finished his night by lifting the puck over Glass’ outstretched skate for the game-winner and his 11th point against the IceHogs this season. Justin Florek also scored for the Admirals, and Kyle Baun chipped in his 12th goal of the season for the Hogs.